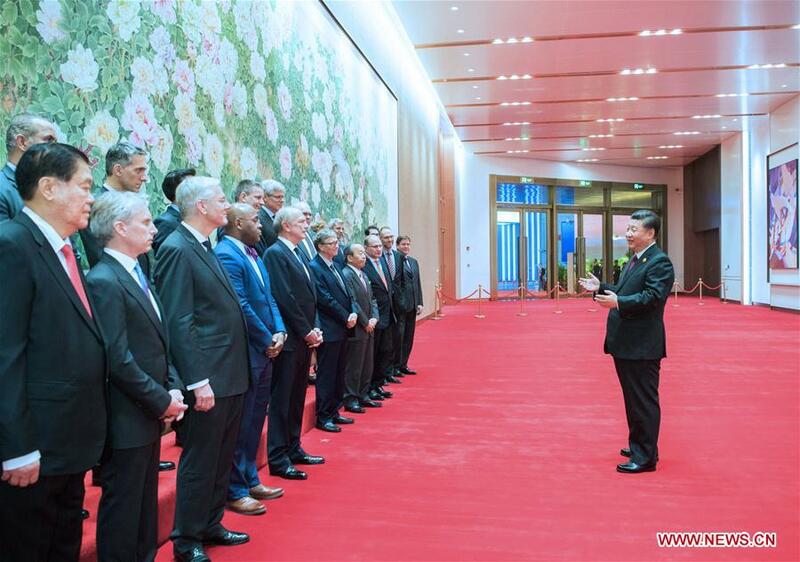 SHANGHAI, Nov. 5 (Xinhua) -- Chinese President Xi Jinping on Monday met with representatives of foreign entrepreneurs attending the first China International Import Expo (CIIE) in Shanghai. Noting that this year marks the 40th anniversary of China's reform and opening-up, Xi said China is working with the international community to build a community with a shared future for humanity. China has introduced a series of opening-up policies and will roll out more such policies, and hosting the CIIE is just one of them, he said. "For problems appearing in the process of China's deepening cooperation with other countries, we will solve them through reform and opening-up, and overcome them while moving forward," he said. China will continue to offer a good environment for foreign companies investing and operating in China, Xi said, adding that firms from all countries are welcome to share opportunities created by China's development and achieve mutual benefits and win-win results.